That’s what writing music and poetry is all about to me. It’s about slowing down. Relaxing the brain. Letting it float into spaces with no air, light, or gravity, spaces where one can simply wander, filled with everything and nothing, needing and wanting so little it’s hard to know if you’re even alive. You just sit, and all the little atoms of the world around you come to you in disparate fragments, puzzle pieces that often don’t even make sense until the song is written, the music is played, and the sound has settled solidly within. The world outside makes sense to me. 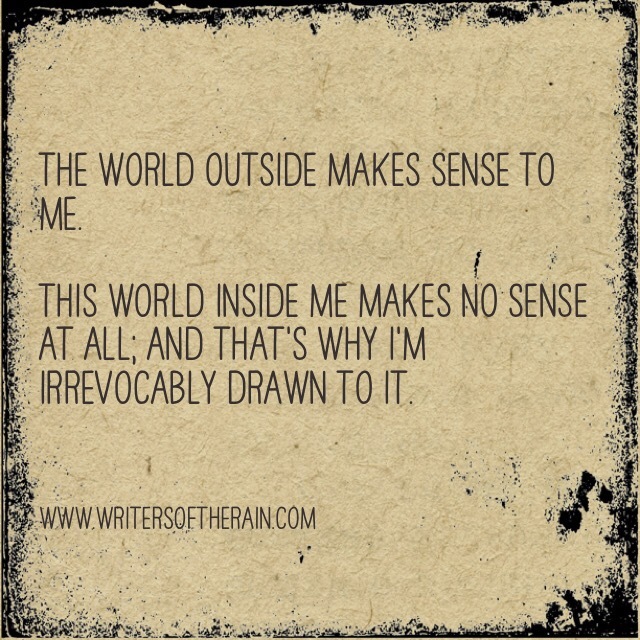 This world inside me makes no sense at all; and that’s why I’m irrevocably drawn to it. Exactly! And so much freer than the real world.